Camping — setting up a tent and sleeping in it overnight — is a classic outdoors activity for families. 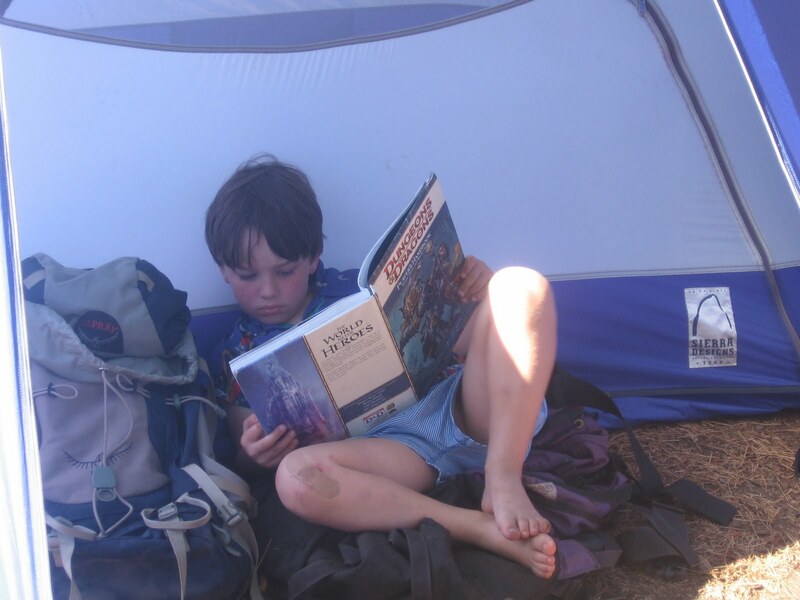 And no wonder: Camping gives children and parents a concentrated experience of being "home" together in the outdoors. But it can be hard to get started. Cardigan Lodge Manager Tom Fisher hears many of the questions that parents have about overnight camping: Should my children be a certain age? What if I don't know how to set up a tent? How do I keep my children occupied? What do I do if a child gets scared in the middle of the night? AMC Senior Naturalist Nicky Pizzo, who often hears similar concerns, offers this simple advice: "Take baby steps." As AMC staff and as parents, Pizzo and Fisher have learned that following a few basic guidelines can help create memorable and happy first camping experiences for even the youngest children, and their parents, too. Begin at home. In her own family, Pizzo set the stage for overnight camping by setting up a tent in the yard for her daughter, Lily, when she turned two. The tent made an exciting new play space. Lily spent hours in it surrounded by her favorite stuffed animals, toys, and books. When the family was ready to spend a full night in the tent, it was already firmly established in Lily's mind as a comfort zone. Equipment helps but isn't essential. Part of what Lily enjoyed about her first night in a tent was the fun she had using a new headlamp. Having her own gear gave Lily "a real sense of ownership" of the experience, says Pizzo. However, families shouldn't feel they need to buy every piece of camping gear: Lily's family left the decision about buying sleeping bags for another year, preferring to roll up blankets to sleep in, instead. Stage the experience. "You don't immediately have to start climbing mountains" when you go family camping, says Fisher. He took his children car camping when they were young: "Omigosh, the gear that came out of that car!" From that beginning, they moved on to carrying backpacks a short distance to a group campsite, and then added elevation gain and backcountry camping. Leave electronics behind. Children may want to bring their iPods, handheld video games, or DVD players on camping trips, but Pizzo strongly recommends leaving those items behind. "Kids fall back on what they're used to," she says. Establishing a no-electronics policy gives children a chance to find other ways to exercise their imaginations and creates more room for the kinds of family bonding and stories that don’t happen at home. Pizzo encourages parents to give extra assistance and encouragement to children who struggle with the transition from electronic stimulus. Things that go bump in the night. The more comfortable children are sleeping outside, the more they enjoy the experience. "Most kids are afraid of the dark," Pizzo says. "Your goal should be to make it seem less scary, but still exciting." That means no ghost stories around the campfire the first few times you go camping, no matter how much kids say they want to hear them—unless you want to be up all night, too. Pizzo tells the children she teaches, and her daughter, that a twig cracking at night sounds extra-loud and unfamiliar, but that there's nothing outside at night that's not there during the day. Get advice from the pros. Camp in places that offer additional support. Tom Fisher calls Mt. Cardigan "a great starter mountain" for families who want to gain more camping experience. Campsites are only a short distance from the main lodge, providing a margin of safety and comfort for novice campers. Naturalists and guides staff the lodge during the busy summer season and are on hand to answer a wide range of questions, from "What's the name of that tree?" to "How do we put a rain fly on this tent?" Fisher says the extra support is an important part of the Cardigan experience: "We don't just say, 'You're in campsite 24B. Good luck.'" Looking ahead to the 2011 season, Fisher and the Cardigan Lodge staff want to make it even easier for families to try overnight camping without needing to buy or borrow gear. They hope to have tents and other equipment available free of charge for families, and to offer educational programs about camping, as well. Fisher says, "We think there's a need." - Find outdoor how-to tips, destination suggestions, gear advice, and information on AMC family trips on AMC's website. - Read more tips in "So, you think your kids are ready to go camping?" (AMC Outdoors, June 2005). - Find out more about the Cardigan Lodge campsites. - Read about great family campgrounds.